Collard greens. 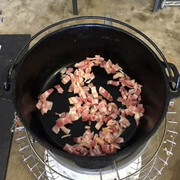 If you've never tried you don't know what you're missing | Smoking Meat Forums - The Best Barbecue Discussion Forum On Earth! 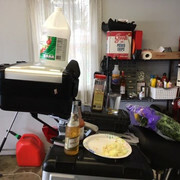 Discussion in 'General Discussion' started by Holly2015, Apr 14, 2019. 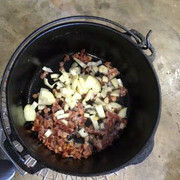 Dutch oven reheating on the Kerosun heater in the garage while I cube up a few slices of bacon and a small onion. 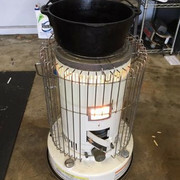 As a side note: Over the winter I use the Kerosun heater to heat my garage when working out there. 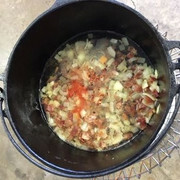 This winter I have really enjoyed using it coupled with a Dutch as a heat source for heating the garage as well as cooking that I think this staying in the garage year round for kitchen duty. It provides a great soft heat for simmering and gently slow frying. Add in a cup of water 1 chicken bullion cube, dash of hot sauce, a bit of crushed red pepper and a small glug of distilled vinegar and bring to a simmer. Add in collards and cover for a few minutes until they wilt. Then stir back down the heat and simmer for a hour or two until tender. Stir ocasionally. If liguid runs low add more chicken bullion water. As a side note I do prefer to buy whole collard leaves and trim the stem out only using the leaves but I was not the one who picked up the greens. HalfSmoked, tardissmoker, Bearcarver and 1 other person like this. Being from the deep deep south we know collard greens. Soul food!! My grandmother showed me how to cook them when I was 10 years old. Turnip greens and mustard greens as well. Good job! Add a little sugar. You will like it! Oh yeah! Love em. When I was a kid. Our neighbors, deep relocated southerns. Got me hooked on these. They grew them in their garden. And put homemade sausage in with it. Or hocks. Loved it. And them. God rest their souls. Today I use fresh or canned greens. But cook them the same way. And I put Kielbasa in with it. And let in slow cook all day. Then plate up with the Kielbasa on a roll with sweat and spicy mustard. And a load of greens on the side. For the past 15 years I've been working with Italians. And have grown very fond of beans and greens. Which I'm still trying to make. My last few tries were sad. I just picked up 8 pounds of double smoked kielbasa from Lucky's kielbasa in Shenandoah PA yesterday. Also picked up a piece of Krakowska and a link of Tyrolian Jon Jon. Gonna do up the collards and kielbasa for sure! Wife is from Seattle but with Alabama roots. Made a point of visiting Muscle Shoals studios when we were in town for a family reunion a few years ago. Greens, and the pot licker, are a regular item around here along with black eyed peas on New Years. And Great Idea with the Kerosun!!! Saw the title of this post and I'll add "AMEN". Collard greens are just a tad scarce up here in the Alberta foothills. I eat a lot of Swiss Chard. Any reason that couldn't be cooked the same way??? Having never eaten Swiss Chard but looking at it on the internet I do believe it'd work. As long as its a tough sturdy thick leave that wond dissolve from the simmering you'll be good. Here's he final result. Collard greens with a side of NY Strip roads and red wine/sage reduction sauce. Awesome can do me in on those greens and sausage. Gary chard is a very tender leaf green cooks like and mildly taste like spinach. Stems cook up very tender as well no matter how large they are. But you can use the same seasoning as Holly did. GaryHibbert and Holly2015 like this. After reading Halfsmoked take on Swiss Chard I think it will not work well. 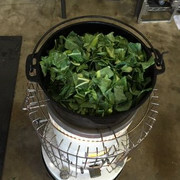 Collards even after cooked are tender but not mushy. They still have a little "tooth" to them. I'd try cabbage instead or add in a little Swiss Chard right at the end into the cabbage. Heck we don't know until we try. The other week I made rollatini for dinner and couldn't use spinach in the filling because my Ma is allergic to it. I looked around and saw a bag of Arugula in the fridge, blanched it cooled and drained it then chopped fine. Turned out better than spinach especially because my Ma could also enjoy it. Chard is easy to grow and does not bold during hot weather. Some people cut the large stems out and cook them like asparagus with butter and salt and pepper. Holly2015 Thanks for the like it is appreciated. Thanks for you thoughts on the swiss chard guys. I'll just have to experiment.